This palnt has characteristic swollen roots which are elevated above the soil to create what appears to be a trunk, these roots look very like Ginseng roots. Urostigma amblyphyllum var. Miq. Miq. Ficus dictyophleba F.Muell. in Benth. Ficus pisifera Hook. ex Miq. Gard. Bull. Singapore 17: 398 1960. Gard. Bull. Singapore 17: 399 1960. 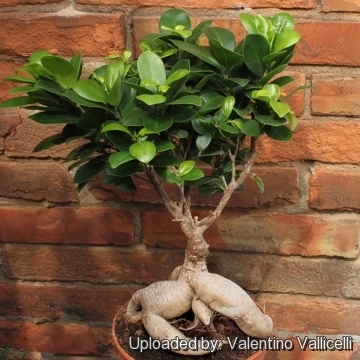 Description: This is a special form of Ficus microcarpa (or Ficus microcarpa var. nitida ?) with a swollen decorative rootstock. The particular shape of this plant is the result of a special manner of cultivation that ensure that the rootstock develops the characteristic shape of the ginger roots. (Ginseng is the Chinese name for ginger root). 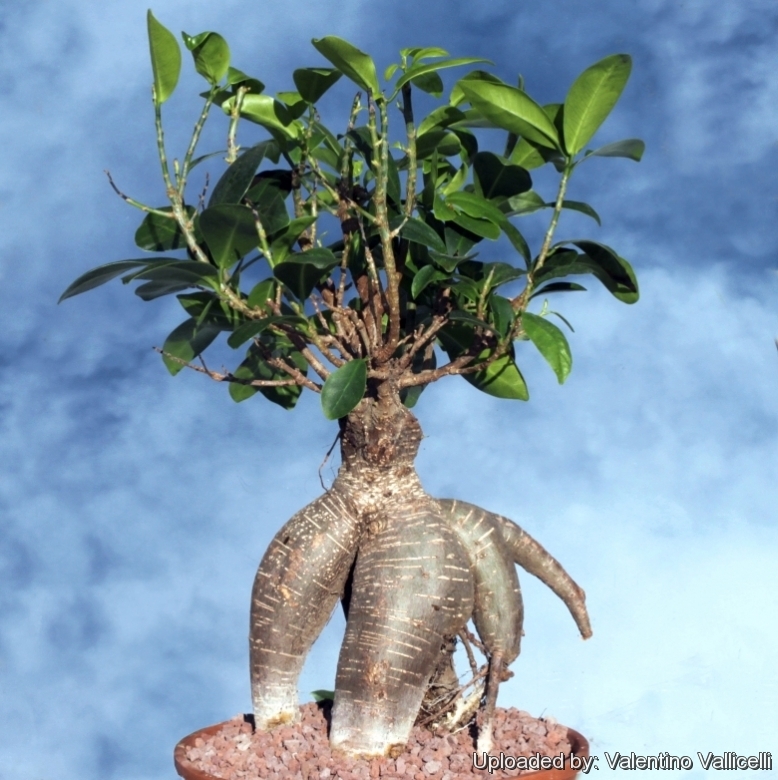 The “Ginseng Ficus” contrarily to the common Ficus microcarpa, which is a massive evergreen woody plant up up to 22(-30) m tall and 42 m wide, is a medium sized shrub that stay smaller and grows only up to only 1,5-3 m tall. Leaves: Green to dark green leaves which alternate up the stem and which are more oval than the Ficus benjamina and more like the Ficus retusa, but broader. Ficus microcarpa cv. Ginseng: has characteristic swollen roots which are elevated above the soil to create what appears to be a trunk, these roots look very like Ginseng roots.